America’s race to the moon was like the competition with Nazi Germany to make the atomic bomb: the “race” mobilized immense resources while the opponent failed to compete. In the case of the A-bomb, this became evident only after Germany surrendered. Not so in the race to the moon, when the absence of competition became apparent just a few years after President Kennedy’s stirring declaration of intent to land a man there and return him safely within a decade. John Logsdon’s book, John F. Kennedy and the Race to the Moon (Palgrave Macmillan, 2010) brought back memories of being transfixed to the television during manned space missions. John also reminded me of things I had forgotten, or never knew, like Kennedy’s interest in a cooperative moon venture with the Kremlin both before and after his speech, and how Congressional budget cutters started paring back appropriations as early as 1964. Kennedy himself had second thoughts about these expenditures, but his enthusiasm revived whenever he met with the astronauts or visited the facilities engaged in making the wondrous machines needed for their voyages. John writes that, “Apollo 11 was the first great exploratory voyage that was a shared human experience – what historian Daniel Boorstin called ‘public discovery.’” The US space program continues to generate extraordinary discoveries, but they lack the profound public impact that derives from human exploration. John now reluctantly concludes that Apollo’s “grand, costly unilateral effort racing against a firm deadline to reach a distant and challenging goal” is not replicable. Contraction has followed expansion. Subsequent chapters of the space program — the shuttle and the International Space Station – marked a retreat to low earth orbit. As John notes, “Apollo turned out to be a dead-end undertaking.” As a result, “NASA entered a four-decade identity crisis from which it has yet to emerge” – the subject of John’s next book. As China gears up for its rendezvous with the moon, applause will be due, as well as a sense of wistfulness – but please, fellow US citizens, hold the envy. Envy is unwarranted from the country that accomplished this feat half a century earlier. In “The Case for Space,” an article in the March/April 2012 issue of Foreign Affairs based on his new book, Space Chronicles: Facing the Ultimate Frontier, Neil deGrasse Tyson hopes that China’s space spectaculars will prompt another “Sputnik moment.” This projection rests on Tyson’s faulty assumption that NASA’s woes are a result of partisanship on Capitol Hill. In actuality, the ambitious space pronouncements of President George H.W. Bush, George W. Bush and Barack Obama all met the same fate because Republicans and Democrats alike weren’t buying. Kennedy challenged Capitol Hill to come up with big bucks or not bother to go for the ride to the moon. Another Sputnik moment is very hard to re-create when the mission is a long way off, does not feel compelling, and when the United States is deeply in debt. A fitting next act in human spaceflight continues to be elusive. Extravagant costs for great adventures could be justified in the America of the early 1960s, but not now. Newt Gingrich discovered this on the campaign trail when he promised Space Coast Floridians that, in his second presidential term, he would colonize the moon. This promise greased Gingrich’s steep slide in the polls. Some argue that the “malaise” of the US space program constitutes a failure of imagination. I disagree: it’s about being unable to match up a compelling vision for human space flight at a cost that doesn’t feel exorbitant. The United States is not ready to do this just yet. In the meantime, extraordinary missions are underway and are being planned to learn more about the cosmos. In this realm, modest additional funding can yield significant rewards in terms of discovery and collaborative US leadership. In my imagination, the folks who conceive of and execute these plans are wearing flight suits and astronaut gear. Interesting. The dysfunctional missile defense system has already cost much more and delivered nothing in the way of true national security. If we view the reactions of China and Russia it has DECREASED our national security. One thing that is striking in reading accounts of Apollo 11 from the time are that the enthusiasm was muted even then. In 1962, going to the moon could be an unadulterated American good. By 1969, confront at home — Civil Rights + Vietnam — made a lot of people feel that NASA was a thing for white men who grew up under Eisenhower, people who thought spending billions on symbolic science projects was a good idea while ghettos burned, young men died by the thousands in Southeast Asia, colleges erupted, and neighborhoods crumbled. TIME magazine had a great coverage of this in their July 25, 1969 issue, where they asked if the Moon was white — and perhaps also middle aged? With respect, Michael, “being unable to match up a compelling vision for human space flight at a cost that doesn’t feel exorbitant” is just a verbose way of expressing a failure of imagination. That’s how much confidence the markets have in the U.S. government, compared to all else. Whether manned space is the right choice is another question — it’s not necessarily what I’d choose — but we could certainly use some project of a similar magnitude to lift our spirits, to say nothing of the limp economy. It is precisely vision, not funding, that’s in short supply. Confidence is funny thing, especially in economic circles. One has it in spades until it dries up totally in an instant. Greece and other European crisis countries are a prime example: they were borrowing at historic all-time low rates less than a year prior to the start of the acute crisis. The fact that rates are low now has little to do with rates in a year if the basic budgetary health is poor. Taking current rates as an examples is triple foolish right now. There are two external factors that are pushing the US interest rates down: incredibly loose monetary policy by Fed and the crisis in Europe. The former will come to end sooner or later if by no other factor than the inflatonary pressure mainfesting first through oil and petroleum products. The latter means that market is not flocking so much to US Treasuries as they are flocking away from European debt. In the land of blind the one-eyed man is king. And in the world of crippled sovereign economies the merely limping one seems like an outright sprinter. Anyone with some ability of having foresight should be able to see for themselves how the current course just can’t continue. Just reading the CBO’s numbers should be enough for that. Especially if one adds the Social Security and Medicare numbers to the general budget. The weakness elsewhere is giving US a valuable time to do something about it. But taking the reprieve as a sign that all is well and not as an opportunity to fix the federal budget will turn a painful correction into outright disaster. Of course it seems that the Congress is determined to do just that. I will have to disagree. I too grew up with the space race, my father worked for Boeing on the S1-C first stage, and I wanted (and still want) to be an astronaut. But the reality is that we Americans are, including our pension and health insurance forward commitments, several trillion dollars in debt. Another 150 billion spent on creating some new hardware and perhaps planting a flag on Mars is just not discretionary spending we can afford. Further, we have reached the practical limits of what we can do with chemical propulsion — a small sojourn on the Martian surface. So, barring a technological breakthrough, we aren’t really going anywhere too spectacular. These are the current facts as I see them. I believe the current funds are better spent doing research on future revolutionary propulsion technology, and otherwise spending a limited amount of funds on robotic exploration and higher resolution telescopes covering various bands of the electromagnetic and particle spectrum. Those 2% 10 year note rates you are seeing is due to the Federal Reserve printing money in an attempt to jump start our economy. This is equivalent to a tax on all who hold dollars, i.e. most of the citizens of the United States and many foreign investors. The Federal Reserve has the ability to set the interest rates by supply electronically created dollars at any rate that they want. So the extraordinary low rates that you see are not representative of investor confidence in the United States, but are instead representative of the fact that any United States Treasury security can be paid off by simply creating more such dollars. This is a temporary last ditch effort to revive the economy. The Keysian spending programs are in my opinion just creating mostly entropy, because in the end, we will have nothing left but the memories of a few years of slightly greater employment, but a lot higher debt towards are children’s future. 1) The Fed sets short-term rates through open-market actions, but doesn’t have the power to move long-term rates, other than at the margin, maybe. Long-term rates are essentially a market forecast of future short-term rates, plus a risk premium. 2) Regardless, real interest rates are in fact negative. N-E-G-A-T-I-V-E. That’s an extraordinary condition: the government can earn money by borrowing it. It doesn’t matter so much why one imagines it is so. 3) A defensive crouch will not help in any case. Just for example, look at what’s happening in Europe vs. what’s happening in China. The record of the last few years suggests it is not so wise to try to cut one’s way to fiscal health. A more sensible idea is to grow one’s way to fiscal health. Especially when one is talking about trillions of dollars of liabilities. 4) We agree that manned spaceflight should not be our first choice for where to invest. Perhaps nothing to do with space at all. I’m partial to energy R&D. This, of course, represents a trade-off. If you want to revive the manufacturing/export sector of the economy (so that we don’t have to finance our imports with debt), then what you should want is a cheaper dollar. The financial/nonproductive sector of the economy has arguably been bolstered by an overvalued dollar at the cost of other sectors. Who is that a tax on? As a member of the Sixties generation living in the States at the time, I can confirm that the uplifting (no pun intended) effect of the Moon Race wore out pretty early on: just remember the then pervasive lyrics of Barry McGuire’s ‘Eve of Destruction’ (1965): ‘You may leave here for 4 days in space. But when you come back, it’s the same old place…’. Also,impressive as it was, the Moon shot itself was already old science when it happened,led by the slave-labor gang from Pennemünde recycled in lily-white Huntesville, Alabama, building a bigger and better V-2. Give me the hunt for Higg’s boson (today)or the decoding of the human genome (yesterday)if you want to combine real science with excitement that catches the layman’s imagination. I will note that Congress has compelled NASA to start development of a Saturn V-class heavy launch vehicle and to continue development of a manned capsule to fit on it. It’s true that no programs or missions beyond two demonstration flights have been identified for the HLV, but there’s a vague hope that something affordable might appear in the future. To be complete, however, it’s worth noting that NASA was originally planning on building both vehicles from 2005 to late 2009. The Obama FY11 budget unveiled (by surprise) in early February 2010 canceled both programs. Congress merely compelled NASA to continue the programs. This action can be viewed many ways, but one interpretation is that Congress is imposing consistency that the Obama administration did not desire. Joshua is right: our current space program is an appalling failure of imagination. Space flight isn’t cheap – duh – but I would state with clear belief that it is money far better spent than funding the unfundable, i.e. the current state of entitlements that the US government and populace have chosen to enter into. It is far easier and more rewarding to fund sinks of corruption like ACORN and its follow-ons than it is to invest serious money in developing new technologies using the smartest people around. It’s a lot easier to spend billions on education union jobs (that fail to educate) than it is to send a modern Mariner to each and every of the planets in the next 10 years to permanently orbit these. Joshua is right: we don’t have to throw people into orbit (there’s justification for doing so at some point, but we get bigger bang for the buck by using robots), but right now we can’t throw much into orbit. Of course the current state of government financing doesn’t allow for the kind of vast spending that Keynes envisioned to kick-start the economy: at a certain point, debt takes on a life of its own (especially when those lending the money desire to have it actually repaid one of these days), and we are beyond that point (as is most of the developed world and not a few developing countries as well). But serious work on exploring just the little corner of the galaxy we live on is money vastly better spent than lining the pockets of corrupt politicians. Given the current paucity of what I would call real statesmen, of the calibre of a Teddy Roosevelt or a Kennedy, this is unfortunately not likely to change. Me, I’d like to go back in time and stop the meme “we have so much to do here, why are they wasting money going to the moon” from being understood as such, rather than what it really is: “I want some of that money for my pet projects and to hell with advancing human knowledge”. Perhaps more than 99.9% people who can not hold the envy for the Chinese lunar program have not read Arvind Subramanian’s book “Eclipse” nor his essay on Foreign Affairs that gives the gist of the book. They feel the envy not because what China can do right now, but because what China will do when their children and grandchildren grow up. Al Gore remembers the shaking of his body by the vibration from the Saturn V rocket when he was a boy witnessing the launch of Apollo 11 on July 16, 1969, the heyday of Pax Americana. Those who cannot hold the envy are wondering whether they have to go to Wenchang Satellite Launch Center to experience the will to go where no one has gone before. They are wondering whether the Empire has lost its mojo. On the US side, it does seem that Kennedy was experiencing a bit of sticker shock by 1963, and certainly Johnson had no great enthusiasm for the program. Had JFK not been assassinated, it is possible that the United States would have stopped playing the game in 1965-66 as well. Instead, Apollo became part of the Kennedy legacy, a marginally affordable aspect of Camelot that nobody was quite willing to kill until it had had its moment of glory. Regarding the future: The people, and the institutions, which accomplished Apollo are no more. NASA of the 21st century is an organization that is very good at turning money into job security, and I do not see any credible path at any funding level to truly great or inspirational accomplishments. Organizations such as SpaceX, Bigelow, Blue Orgin, and the like may have the potential for inspirational greatness, but there are limits to their present resources and capabilities, limits to the additional funding they could reasonably absorb without choking on it, and of course obvious problems with any plan of the form “We are going to give these people who are already billionaires, billions more in taxpayer dollars just because they promise to do great and inspirational things”. Probably the best course is the middle ground in which the private spaceflight companies are given the most favorable conditions for success, with NASA being encouraged to use their capabilities to the degree that they can be credibly provided in the near future. NASA should otherwise continue doing what it does best (yes, including the job security part), at a moderate level of funding and with only moderate expectations. The present administration seems to favor this path, with the congressional opposition, well, opposing. If you’re looking for a way to turn an extra ten or twenty billion dollars in borrowed cash into something great and inspirational, it will be a few years before anyone in the space industry will be able to handle that responsibility. Anyone care to predict the rates on 10-year treasuries in 2015? I think the “Moon Race” was a wonderful enterprise. Did it destabilize the strategic disposition of any player of the Cold War? Did it drive either sides to develop new nuclear systems? Did it drive further the military engagements in Southeast Asia? Did it further destabilize the military standoff in Europe? Did it drive any of the incidents at sea? As for social spending I ask this. After decades of spending far more on anti-poverty enterprises than we ever did on manned spaceflight, or even manned and unmanned spaceflight, have we really made a appreciable dent in American poverty? After 50 years of effort, American education is worse off, and poverty changed little for the investment. We are blowing open the solar system for exploration, and in doing so, there is no obvious destabilizing effect to the world’s current unbalance of military forces. I think space could be a perfect sink for funds that could normally go to the military and redirect militaristic energies to an environment that can absorb any efforts we are able throw at it. As for the future of American poverty. Do you think American kids growing up in poverty are inspired to attend college by their social worker? Surely it happens on the rare occasion. However I think watching the Solar System develop into a set of individual worlds and places do far more to direct the trajectories of peoples lives. Living in a Solar System of many worlds I think has far more to offer to humanity than a finite planet crawling with military forces building up for doomsday. This is a much broader discussion, but I think it’s worth pointing out that the American poverty rate *did* materially change as a result of the 1960s spending programs, in particular with regards to senior citizens. Fluctuations of poverty depend on quite a lot of factors, but claiming that there’s no way to affect it through applied federal spending is just not borne out by the data. The poverty rate was around 22% at the beginning of the Kennedy administration; by the time of Apollo 11 it was almost half of that. I think saying, “what can be done about that?” is an awfully convenient way to discharge responsibility for a lot of policy outcomes, both good and bad. I am not so sanguine about the lack of destabilizing effects here on Earth from a space colonial enterprise. All previous colonial enterprises had massively destabilizing effects with regards to the home regions of the colonizers. I don’t see why transposing Earth’s current rivalries, concerns, and fears into space would decrease, rather than intensify, them for those of us still on this planet. One might still think it is worth doing, for various reasons, but I question holding it out as a necessarily peaceful and positive thing. There are no examples from history that would make us think that such would be the outcome of a large-scale colonial effort. Mr. Krepon, an excellent, thought provoking, and insightful article, as usual. Thank you for eloquently expressing your thoughts and allowing us to read them. As an engineer, I often pine for the (perceived) halcyon days of the Manhattan Project, or the space program of the 1960’s. But I’m afraid those days are over. Instead, if one wants to look at what programs and industries are experiencing that kind of explosive growth, one needs to look at Apple. Or Google. Or Facebook. All of whom are rapidly charting new territory, and spending gobs and gobs of *private* money to do it. For example, Apple’s data center in North Carolina alone cost an estimated $1B to build and consumes 20 MW of power. With the bureaucratic handwringing and the extreme risk aversion of technical government programs nowadays, ambitious projects on the scale of Apollo are unlikely to be carried out again by the government. The struggle between those willing to have the government take actions to develop transportation and those who are opposed has been going on in the USA since the beginning. The National Road, the Eire Canal, the Transcontinental Railroad, the Panama Canal, the Interstate Highway System, the Air Traffic Control System. All drew strong advocates, and vocal opponents. The controversies usually revolved around the issue of taxes and expenditures. The outstanding thing about the moon program was that it eschewed developing transportation in favor of transporting men to the moon as a public relations/propaganda stunt. When the time came to actually develop a practical means of transportation to and from low-Earth orbit, the ‘Space Shuttle’, there was insufficient money to develop a practical system. In the end the Apollo program achieved it’s propaganda goal. In the end it was a waste of money that could have been spent developing the ability to provide less expensive access to low earth orbit. It is an irony that Disney’s ‘Tomorrow Land’ portrayed a more practical approach (courtesy Von Braun) to space than the ‘vision’ of JFK. Did we get what we paid for? Most certainly yes. Did we get what we needed for practical reasons instead of propaganda? Most certainly not. Apollo was both a magnificent achievement and a Greek tragedy. Mark Lincoln’s comment reminded me of Thomas Jefferson’s reaction to the proposed construction of a 363-mile canal from Albany to Buffalo, New York–“little short of madness”–although he allowed that it might be possible “a century hence.” Yet by 1825, the Erie Canal was completed, by the state government rather than the federal. Perhaps this shows that some things may be more doable than they appear, and/or that conditions change. Just because NASA may have grown stodgy (though, I must say, job security is certainly what I envy), I think it’s a bit of a leap to suggest that no further great projects are possible. New institutions can be created; old ones can be shaken up. History hasn’t found it final culmination in the bureaucratic sclerosis stage. > Yet by 1825, the Erie Canal was completed, by the state government rather than the federal. Perhaps this shows that some things may be more doable than they appear, and/or that conditions change. I’d say that the motivating condition then was that Albany and Buffalo already existed and were economic centers just awaiting more opportunity. In addition, there were other points where you could do business along the route. I.e., there was strong reason to connect the dots for clear reasons of commerce. Today we’ve got Earth (read Albany) and the moon, which isn’t anything like Buffalo, and not much else in between. Some important discoveries or serious bootstrapping are needed for human space flight to make economic sense. Discoveries can’t be counted on and the amount of bootstrapping needed would be very, very expensive. I take your point, although Buffalo only barely existed. It–and really the northern Midwest–developed as a consequence of the canal. My broader point is that it’s short sighted to say large projects will never happen because we see obstacles to them today. This is false. There is substantial information, in the form of declassified US intelligence documents and declassified Soviet space program documents, indicating that there WAS a Moon race. After all, why did the Soviet Union build a Saturn V equivalent rocket and a Moon lander? We photographed that rocket on the pad a year before the launch of Apollo 11. It is completely inaccurate to state that “the opponent failed to compete.” It might be more accurate to state that the opponent competed badly. But it’s ridiculous to say that just because one side won and the other side lost that the race never took place at all. Excellent discussion in the posting and comments about the moon race. Very poor choice using a photograph representative of the cavalier and misogynistic attitudes regarding violence toward women at the time Jackie Gleason was popular. 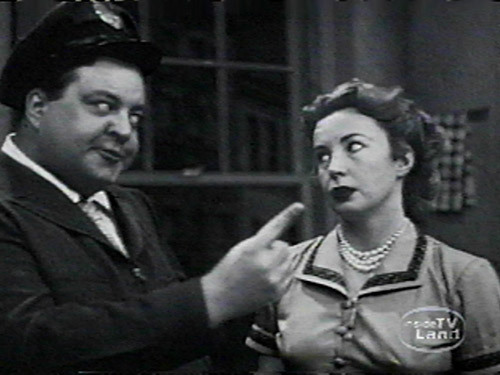 Fortunately, Ralph Kramden was a harmless blowhard who never laid a finger on anybody. The space race is mentioned in the foregoing tapes, see excerpts from Gromyko, Foy Kohler, and JFKennedy. For presidential history documents, there are sources in at least two universities: the Miller Center at the U of VA, and the American Presidency Project at UC Santa Barbara. However, as the blog graphic illustrates, times have changed; and several commenters mention in various perspectives their reflections on the substantive value of the ways we have morphed since the days of the moon race. NASA continues doing legion work on climate change, too. Subjectively, the live video feed of the moon landing seemed more theater of the absurd than feat of science. I have a lot of problems with this entire essay and think that it veers all over the place with the issues (not to mention–as I’ve already mentioned–that the opening statement about there being no race to the Moon during the 1960s is demonstrably false. See, for instance: http://www.thespacereview.com/article/2013/1 ). There is no clear and compelling evidence that China plans a human lunar mission. Their existing human spaceflight program is clearly focused upon assembling a space station by 2020. They have announced that they are beginning “studies” of human lunar missions. But that does not imply a commitment. After all, NASA is currently studying missions to L2, Mars, the Moon, and asteroids, and there is no official commitment to any of these missions (there are official statements that sending humans to an asteroid is a goal, but there is no funded work within NASA to achieve this goal). Actually, the bigger faulty assumption is that Sputnik, or the Moon race, can be repeated. Those were unique events in world history. This is one of the points of Logsdon’s book. Well, it depends upon how you look at it. The Vision for Space Exploration unveiled by Bush II in early 2004 was later ratified by Congress in two bipartisan authorization bills. Congress _agreed_ with that plan. There were a number of problems with it, but it’s hard to lay the blame for its demise on Congress. A more accurate explanation would include failure by the Bush administration to fully fund their own plan (they never provided the money that the administration itself said was required) and failure by NASA to manage the plan effectively. As for the failure of the Obama plan, there were multiple things that went wrong (including an initial implementation that angered everybody in Congress). But you could also say that Congress had endorsed the previous plan under Bush and did not like it when the new administration shelved it and came up with something entirely different. They had “bought” one approach and wanted that one and were unwilling to buy the new approach. I’m not arguing in favor or against any of these plans, but pointing out that this article makes some false assertions. Well, in the end they failed, and then they told us that they did not take part in the race; Which race was that ?